Yes, I know — a purist brews with a teapot, strainer, or other manual mechanism that allows artisinal control of the variables of tea. 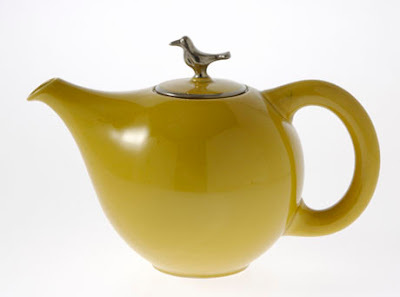 And usually, a purist brews only enough tea to be consumed immediately; he or she never lets brewed tea sit for later: Either all of the tea is poured into cups, or the cup in which the tea was brewed becomes the drinking cup as soon as the teaball or permanent filter is removed. But even purist like us must admit there are times when convenience is ... well, very convenient. 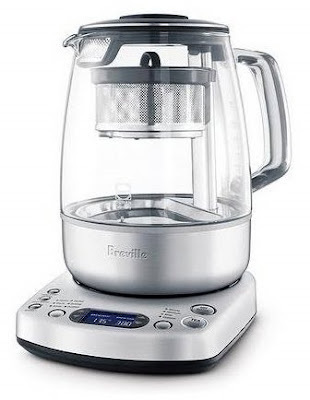 Imagine, for instance, the relaxing time you could have at a tea party with the luxurious Breville One Touch Tea Maker : You simply drop in your green tea leaves, fill it with water, turn a knob, press a button, and brewing gets under way. The Breville — which scores high points on all counts — beeps when it's done brewing and keeps the unpoured tea at just the right temperature until you and your companions are ready for more. By simplifying the brewing of large amounts of tea, this teamaker allows you to devote more attention to chatting with your guests ... and not missing out on the snacks on the table. But for the purist in all of us, I also present the colorful and conscientiously made teaware of Terra Keramik. Keramik — founded and guided by eco-friendly craftsman Fexil Vogler — uses only toxin-free glazes (no lead or cadmium) for its quality ceramics. Pick up one of these teapots or mugs and you'll feel its surprising heft — this dense material will keep your tea nice and warm longer than typical teaware. Products like those of Breville and Terra Keramik are obviously produced with the same artisinal dedication to quality as the artisinal tea crafted by our growers. Doesn't this dedication make you feel nice and warm inside, just like a cup of green tea — whether it's brewed in a modern teamaker or in a traditional teapot. Tea and mochi in L.A.
Are you on a happy patch?